When bicycle mechanic Charles Duryea saw a stationary gasoline engine at a state fair in 1886, he got the idea of using it to power a carriage. He drew up designs, and in 1891 he and his brother Frank built an automobile and an engine in a Springfield, Massachusetts, loft. 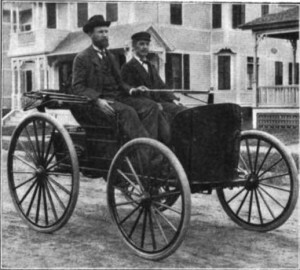 There is a dispute as to when the vehicle was finally completed, but it made its first run on the streets of Springfield on September 22, 1893.